In dermatology, hyperpigmentation is the darkening of an area of skin or nails caused by increased melanin. Hyperpigmentation may be caused by sun damage, inflammation, or other skin injuries, including those related to acne vulgaris. People with darker Asian, Mediterranean, or African skin tones are also more prone to hyperpigmentation, especially if they have excess sun exposure. Suffering from dark spots can be just as much a killer blow to the self esteem as the spot itself. I've told several times before that most times it never really matters how I treat a spot, when it starts to go down the spot turns into a darker more permanent fixture on the skin. Soon you will read a post on skincare I was testing out to prevent breakouts and acne that left me with my most recent scarring. I didn't want to go back down the lemon dousing route just because I wanted something that could work throughout the day. Let me introduce some that I've tested since about February. I nearly always accept products that are to do with dark spot correction cos I truly suffer. Starting with Indeed Labs Peptabright*, the claim was that within 14 days I would see an improvement with my dark spots. O.k. great, 14 days that's nothing, adding this to the routine day & night to see a change is small change in skincare testing. Let me first say this, it smells. The smell of this cream when rubbing it in, seems to release a spicy, plastic, chemical, odd odour. Is it just me? I just find the scent horrid. Once rubbed into the skin, I didn't find it did much on the moisturising side, more so it dried mine out. After my two week period, I didn't notice my dark spots lighten much at all. I decided to try for two more weeks and nothing. Disappointing results. Eucerin was the next brand up & I was surprised with this delivery but it was welcomed as I had been complaining about pigmentation for a while, so I started to use this straight away, it's a three step programme to work quicker and effectively the Spot Correcter* is applied after the face has been cleansed (& toned if you do this) applied to just the dark areas this dries quickly so I can continue applying the appropriate cream. Onto what I refer to as the baby smooth skin cream, the day & night cream* are so soft, light and moisturising on the skin. I love how when it's blended in, my skin feels smooth, I risk just infecting my face with dirt wanting to touch it so much. Within 4 weeks, I should notice a difference if I use this line correct. I saw the improvement, I know the improvement was there as when I was wearing make-up the concealer usage on cover ups was getting less & less. I've been using it for about 2 months I'd say continual use but I did start to add another step. Filorga Pigment-Perfect Spot Corrector* is considered a good alternative treatment to laser, IPL and anti-spot peels, this serum can either be used under your day/night cream or alone. I've used it both ways, sometimes I've used it all over the face when I didn't want my face to have too much on but found that it wasn't enough so when I use it underneath my creams I will just apply it to the troubled areas mostly. It's a white, light, watery, creamy texture that is easy to blend. It has a delicate floral smell, doesn't feel as if I've applied some medical treatment to my skin, the medicinal scent turns me off with products. I had a few spots on my nose and right cheek that started to scar but when I included this in the routine it seemed to speed up and prevent the dark spot process darkening. It makes for a good alternative for the Eucerin Spot Corrector. Below are some images that you can see where I chose not to cover them up without and with make-up just to be able to show a difference of how the marks are so pigmented even under make-up, without concealing and how well it's fading. Set aside a few months it's really nothing and I've not seen a difference in my skins overall appearance with getting lighter, the images are just in different lighting and distance. 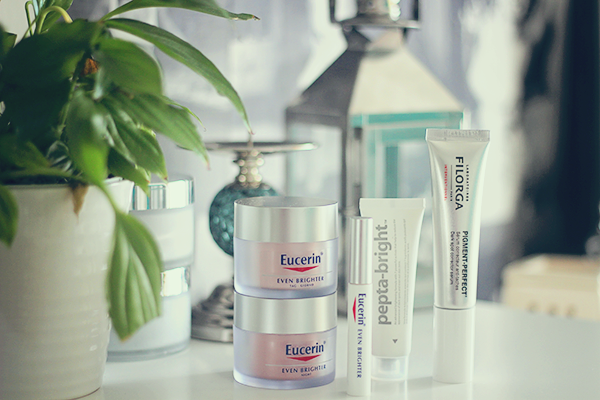 I'm hoping to try a few new pigmentation products as I will always suffer from it no matter what but if you want my suggestion, go with the Eucerin and/or Filorga. This is purely my experience with the products above, it worked to my satisfaction, it may not for you and I cannot be held accountable if it doesn't work, please don't curse me out under your breath at home :) thanks. Great post, I don't have any dark marks on my face but I do have them on my legs from when I would fall as a child and recently I went to Jamaica and I have mosquito bites scars on legs it took a year for them to almost go away when I went last summer but since I went again this year in may I have more now and I have been looking for a way to get them to go away faster. I hope I can find Eucerin brand in Canada :) I really enjoyed this post! I have also been suffering from this problem of pigmentation and uneven skin tone hiding it through concealers. Tried out various creams but they are effective for a limited time so I am thinking of undertaking proper hyperpigmentation treatment from a professional to get rid of these pesky dark spots. I haven't been here for a hot minute! My pigmentation is genetic so i don't think this will help, was worth a read!